Pleased to see that you are completing the edges of the decagrams! 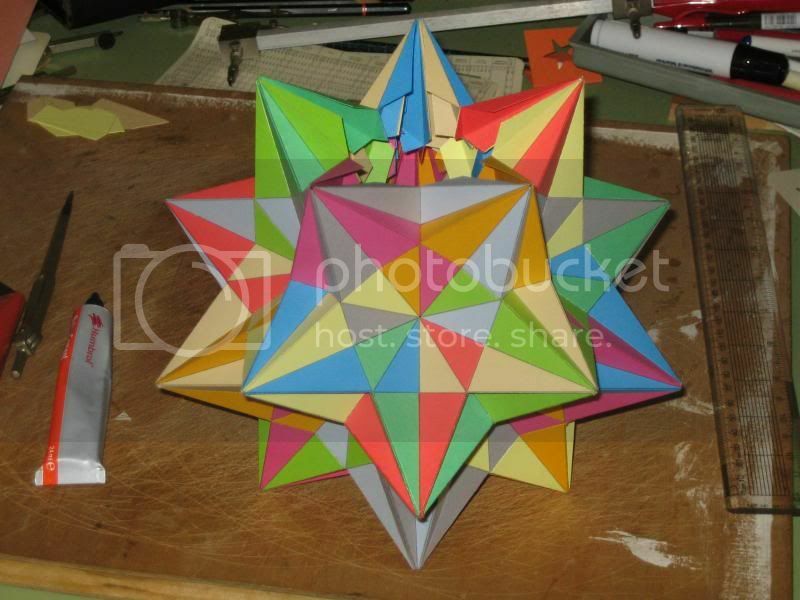 I think if I were making this one I'd use 10 colours for the triangles and 6 colours for the decagrams, so 16 in total. I'm 11/12 of the way there, and it's getting pretty rigid. Presumably you are double-tabbing, so the dart shaped facets will effectively be hinged down their middle. How does this affect the overall rigidity of the model? Did you need to use any internal bracing? I would be nervous about using hinges if only because in time the cement would cause the card that I use to distort. Maybe this is because balsa cement is a tad powerful? Ensure that you close any gaps at all 12 vertices and at all 20 re-entrant vertices. The polyhedron should then be completely rigid and not need any internal reinforcement.